The Christian lapel pin that is worn by Judge Roy Moore. The first tablet: I - IV: our relationship with God. 10 or more pins $3.00 each. Shipping and handling is $3.00 per order, regardless of quantities. What is the greatest commandment taught to us by Jesus? Jesus teaches us to obey the Ten Commandments. To obey them is a summary of love. 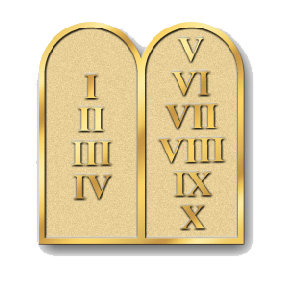 List of God's Commandments of Moses from Exodus 20, listed in order, King James Version. Copy of the God's words given to Moses on stone tables. A copy of our Christian Commandments displayed given by Moses in Exodus 20:1-17: Click here for copy of the list, King James Version.